A Happy 2011 to all my friends in Bloggery! Albert Einstein in 1928: play it, don't say it! "Was ich zu Bach's lebenswerk zu sagen habe: Hören, spielen, lieben, verehren und--das Maul halten." 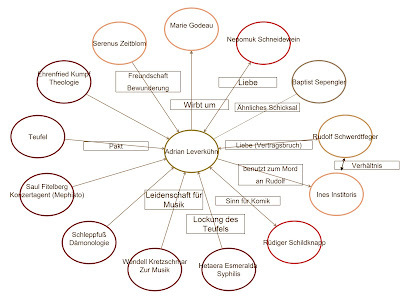 "Zu Schubert habe ich nur zu bemerken: Musizieren, Lieben--und Maulhalten!" Sometimes I wonder why it took me so long to understand the importance of keeping the bow on the same place on the string during the duration of a given note. I always knew about the importance of keeping my bow straight, but I always (abstractly) thought of the sound of a note as being connected with the caprices of the bow hair, and not with the actual vibration of the string. Two bouts of forearm tendinitis, and loads and loads of frustration has finally given way to a simple realization that I would like to share. I find that if I keep my attention on the actual sounding point, and think of the trajectory of the bow as secondary, while I "observe" the vibration of the string, it is much easier to control the sound. Bow changes become incidental and brief interruptions of the string's vibration (and once in a while they don't interrupt the vibration of the string at all). It is really easy to inadvertently allow the bow to slide to another sounding point when the left hand changes position. Consciously avoiding this tendency, and keeping the bow on the sounding point during a shift, allows the string to remain vibrating, and makes for a better-sounding shift. It works with any sounding point--even one near the bridge or near the fingerboard. It makes harmonics far easier. When I share this with my students, their playing gets better instantly. They begin (as I have begun) to lose tolerance for any deviation or dullness in the sound. I wonder why none of the people who acted as my teachers ever noticed my problem? Perhaps it was one of those cart before the horse things, and I was quite expert at hiding it--especially from myself. 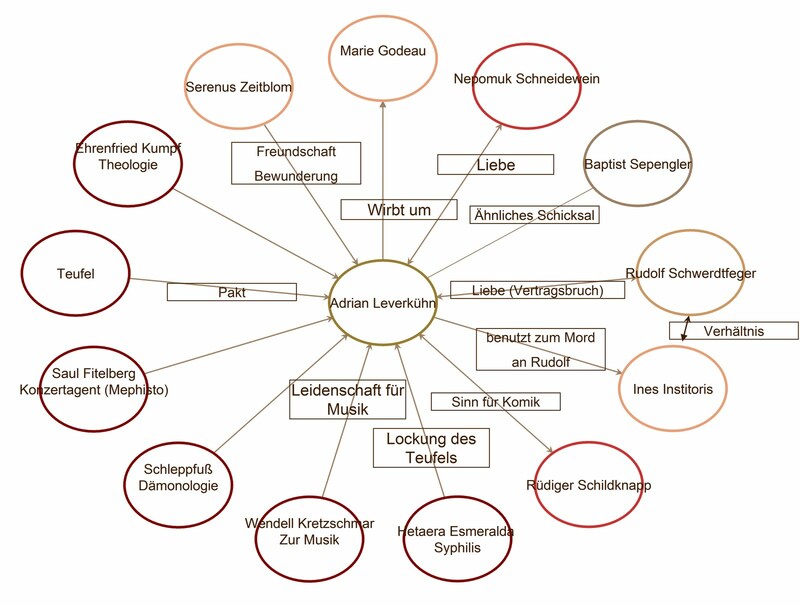 I explained this graphically to one of my recorder students (a person who doesn't play the violin) over a cup of tea. I held a knife in my right hand (like a bow), and I held a spoon in my left hand. I Tried to keep the knife connected with the same spot on the spoon by controlling the knife from its handle. The I tried keeping the knife connected with the same spot on the spoon by focusing all my attention on the spot on the spoon, and letting the knife make its own path. The second way, which involves much less effort, is far more effective. Trying this without equipment, using only the index finger of each hand, is rather enlightening. Just a note on equipment. I only noticed this AFTER I got new bridges on both my violin and my viola (after 15 years). Our son Ben just coined a useful word. A Chrismitzvah is something Christmas-related that Jews do for people on Christmas. Our family just did a Chrismitzvah by playing Christmas music at a convalescent center in our town today. This is, perhaps, the greatest song for the winter season ever! It is attributed to Colin Muset (1210-1250). 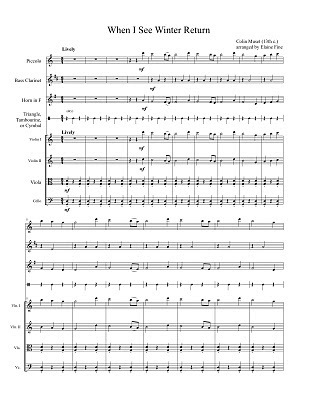 You can download the score and parts here, and listen to a midi here. This is but one arrangement and instrumentation option. If you have Finale 2011, you can easily try one of your own! Perhaps it is in opposition to doing well with music, but in some places and in some cases it has much more lasting significance. Yesterday I played a concert of "seasonal music" with my consort (we play Medieval and Renaissance music) as a benefit for our town's soup kitchen. We played all kinds of buzzing instruments (crummhorns, cornamuses, dulcian), the whole range of recorders (contrabass to sopranino), strings (vielle, viola d'amore, bowed psaltery), and a bunch of percussion instruments. There was no other entertainment aside from watching us all switch instruments between pieces (it was not a historical demonstration or a scholarly lecture). Most of the music we played was unfamiliar to our audience, and all of it was really old. The concert made the people in the audience very happy. It raised $1,500 (in free-will donations), and it allowed us to devote serious attention to rehearsing (we normally play together every week just for fun) and to really bond as an ensemble. It is really rewarding to do good with music. Read it (or just skim it) and groan loudly. 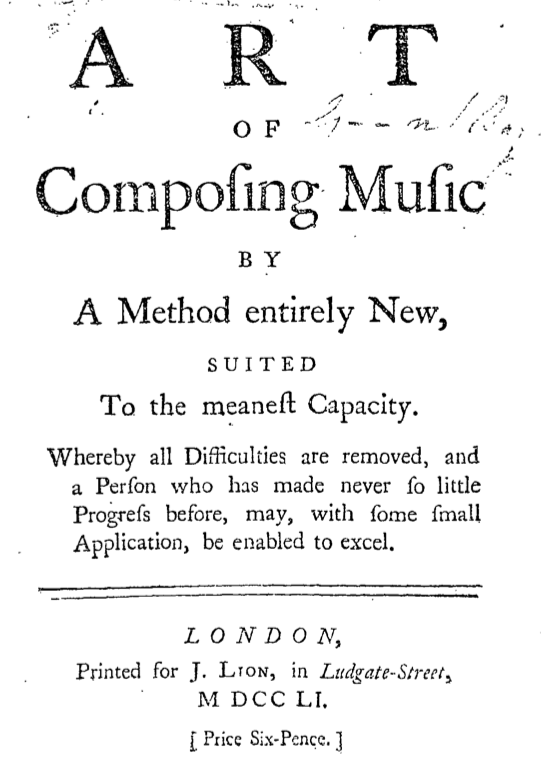 Hitherto the Business of Composing Music hath been chiefly in the Hands of the Masters; but this admirable Scheme of mine will enable Gentlemen to make their own Music; and by a Method so easy, that a Child of Five Years may do it -- as well as myself. Any one must imagine so noble an Invention was not brought to Perfection in a Day, any more than Rome was built in that Time; no; it was a very laborious, toilsome Undertaking. The End proposed, is one Thing; but the Means whereby to effect it, is another. 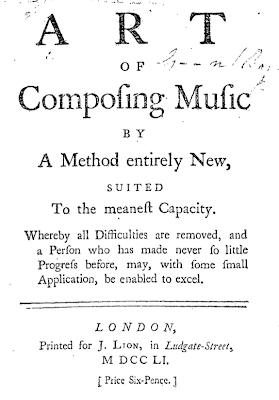 Saying, I would teach the Nobility and Gentry to Compose Music, to the great Mortification of their Masters, was soon said: but finding out the Method, was a Work of great Labour and Difficulty. The first Thing that occurred, was the Lagado: that wonderful Invention of the learned Professor mentioned in Captain Gulliver’s Travels: which, with some little Alteration, might have fitted my Purpose extremely well, and which I could easily have got made. as now I live in a Place famous for mechanic Operations. But then, the Bulk of the Machine, and the Number of Hands required to work is, viz. Forty Pair at least, made it at best inconvenient; and in many Cases wholly impracticable. Otherwise, it would have been the prettiest Employment imaginable for those ladies and Gentlemen who are remarkable for their Dexterity in cutting Paper, and pasted them on the little Pieces of Wood: which you know is very like cutting out the Figures in coloured Prints, viz. Birds, Beasts, Flowers, Trees, Men, Women, Houses, etc. and pasting them on Cabinets and Dressing Boxes, then varnishing them over: this is the modern Art of Japanning; and was the sole Amusement of the Polite of both Sexes for a considerable Time. However, for the above reasons I dropt all Thoughts of the Lagado. Stepping one Day into my Bookbinder’s shop whilst he was at work, I stood some time and chatted with him: regarding but little of aught he did, till leaving me for a Minute, going to one Corner of his Shop, and fetching from thence a Gallipot with a Brush in it: thinks I, what can this be for? I soon discovered, that Use he applied it to, was to sprinkle the Edges of the Leaves, and (with some Variation) the Outside of the Covers. ‘Twill do! ‘Twill do! said I in the greatest Rapture imaginable! and directly flew out of the Shop. Home I went, and immediately made me one of these Machines: which for the future I shall beg leave to call a Spruzzarino; not by that vulgar Name a Brush any longer. I made Experiment of my new Discovery, and fount it answer, even beyond my Expectation. Before I give you thorough Directions in what manner to apply this Instrument, I shall beg leave to suggest a few Things as being absolutely necessary to be observed, in order to make a right Use of it. First, It will be proper you should be acquainted with the different Fashions and Make of the Blackheaded Notes . . .
Not having a proper Spruzzarino on hand, I downloaded a picture of some splatter painting, to which I applied my trusty Noligraph (I followed Hayes' direction to avoid open notes and only consider the black-headed ones). I did this without a thought of anything besides lining up the notes in a plausible way. Marjorie Kransberg Talvi's latest installment of Frantic: the Memoir quotes a letter of discouragement from Harry Ellis Dickson that she got after playing a movement of a Paganini Concerto for a Boston Symphony Orchestra children's concert when she was a teenager. Because this letter was unsolicited, and because Marjorie was not happy with her performance, it proved a double whammy. 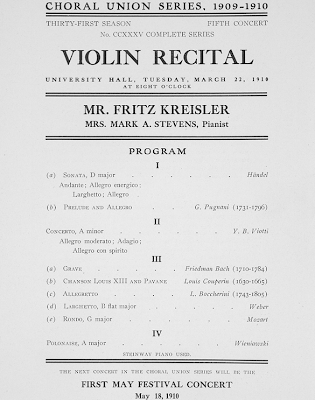 Ultimately what Dickson said in the letter proved to be true: that there other paths in music besides that of a solo violinist, but its living and breathing presence yells out for discussion. I remember all of my direct encounters with discouragement (one unsolicited from Mr. Dickson, as a matter of fact). There have only been a handful. Most people encouraged me to go on in music. My teachers in high school let me get away with very little in the way of work because they approved of the direction I was going. My father's reaction to my SAT scores, "It's a good thing your going into music," sealed the deal (talk about a thoughtless statement!). Now that I am the adult, I dole out my encouragement carefully. I always advise other people's students who seek out my advice (my students already know) to get a real education. I advise them to go to a college rather than a conservatory, and I let them know that in order to have a career as a soloist they would need to have serious financial security and support, and would have to develop all kinds of marketing skills and interpersonal skills. And they would have to compete all of the time. Music departments and conservatories make their bread and butter on convincing students that they can give their students the skills they need to function in the "real world" of music, but once those students get out, particularly if they play winds, brass, or percussion instruments, their degree is worth little more than getting past the resume round of a job application. Many remain in the academic world until they get a terminal degree. Telling a young person that her problems with nerves will compromise her career as a soloist is not telling her anything she doesn't know already. Unsolicited judgments like that from "important people" can actually make the occasional problem turn into a stigma. I imagine that Harry, who had chosen Marjorie as the soloist in the first place, was trying to save face (and respect) in front of his colleagues. I imagine that letter was more about him than it was about Marjorie. We all need to be careful when offering unsolicited advice to young people. Perhaps the Denver Post could do better by hiring a knowledgeable musician to review concerts rather than issuing term papers like this to fill their culture quota. I get tired of repeating myself when I say that "classical" music is not an "it." The institutions that support (read "hire") classical musicians may dumb their programs down, glitz their programs up, shorten their programs substantially, pepper them with extra-musical benefits and banter, cross them over, or bring in choruses of young singers (who bring parents to the concerts), but they are still too few in number to employ a decent number of the many qualified musicians who would like to make their living from music on much more than a part-time basis. For a real look at what is happening in the classical music world, go take a look at the YouTube Symphony's American Idol style audition page. You get the opportunity to choose between an awful lot of excellent young musicians who would like to be part of what is essentially a music festival. The quality of the playing here is extraordinarily high (in contrast to American Idol), but the toss of the coin for who gets a position in the orchestra still depends on the whims of the general public. If you listen with the ears of a person on an audition committee, you will understand that musicianship is a subjective thing, and there are many factors that go into choosing a person for a position. I listened to the viola audition "finals" yesterday. Everyone there can play Don Juan better than I can. Everyone plays Bach differently. Everyone had the opportunity to choose their acoustics and do as many takes as necessary to get a nicely representative tape. I imagine that all the younger people learned a great deal from the experience of making these YouTube recordings, and I know that all violists, both young and old, would benefit from watching Roger Benedict's lessons on Harold in Italy, Don Juan, and the Midsummer Nights Dream Scherzo. I know I did. An audition for an actual paying job in a full time orchestra is judged by a set of people who are given the directive to find the best person to fill the opening. I would imagine that this list of YouTube Orchestra hopefuls would represent about one percent of the people who would apply for an orchestral job. Winning an audition (and people do use the term "winning") these days is riddled with barriers, particularly if it is a principal position, because you have to be a known quantity in order to even be considered for an audition. Take 1000 university and conservatory graduates per year, and unleash them yearly on a set of performing institutions that might be able to employ 50-100 of them in a good year. This is not nearly as bad for string players as it is for wind players. The odds for getting a job as a wind player are far smaller, and the pool of applicants is just as vast as it is for string players. Watch these graduates get advanced degrees and make their way into the hinterlands (like my neighborhood), where all they can really do to support their musical habit, besides play chamber music and recitals for the fun of it, is teach and play in regional orchestras along with highly-qualified musicians who rely on day jobs to pay the bills. It is great to see the quality of musicianship go up in cities and towns far away from the former centers of culture in America, but I can't imagine that we'll ever see the number of employment opportunities (i.e. gigs) go up. Don't get me started on pianists, singers, or composers. This is an instrument called the udderbot, the invention of (now) downstate Illinois' own Jacob Barton (though he invented it while he was a student at Rice). The above video is Jacob's audition for the YouTube Symphony. If he makes it in (he's one of the finalists), it's sure to bring some great publicity to his instrument. If you like what you hear, you can vote for him (and his creation) here. Wanna know how to make one? Jacob will show you how right here. Just remember that the development of the embouchure and breath control takes time. 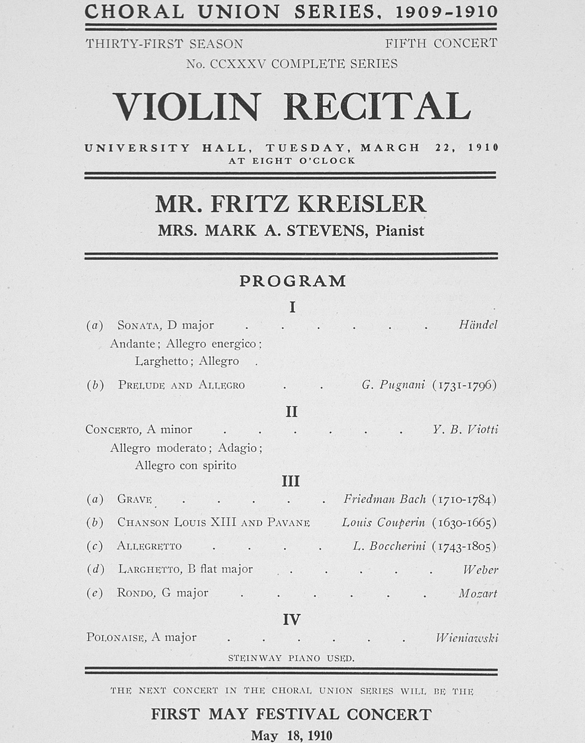 Musicians in America enjoyed the "fat of the land" from the middle of the 20th century to the beginning of the 21st, but before that orchestral musicians who lived outside of major cultural cities (like New York, Boston, Chicago, and Los Angeles) had a very difficult time making enough of a living to support a family from music. Musicians had to work constantly (often playing commercial music) in order to make ends meet, and many orchestral musicians in smaller cities had to take summer jobs outside of music to make it through the "off season," but at least there was work. During WWII and for the next decades, a good number of first-rate musicians had the opportunity to play in what would become the Seventh Army Symphony, which flourished from 1952-1962. Musicians who were not enlisted (for various reasons) were needed to fill the ranks of the American orchestras, so low-paying employment opportunities for competent orchestral musicians were almost plentiful. Musicians from New York made their way westward to places like Cleveland and Indianapolis. I know a bunch of them who returned to New York because they could make a better living freelancing. As these orchestras became more established, musicians could make enough money to live from their orchestra jobs. Through the second part of the 20th century we saw an explosion of high-quality music making coming from places all over America. Great conductors from Europe made America home, and musical life flourished in many cities. 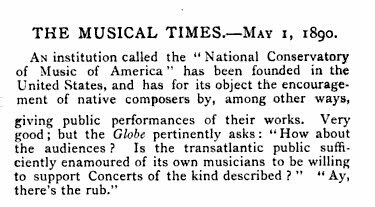 Conservatories produced new generations of employable and employed musicians, musicians and audiences began embracing new American music, and the quality of musicianship kept going up and up. The 1960s and 1970s were years of great hope for music. Young musicians had options. Some took orchestral auditions (and the good ones got jobs), and some decided to become university professors. The really good musicians who went the university professor route (and you could do it with a Master's degree even in the 1970s) became excellent teachers, and produced musicians who were even more competent than musicians from previous generations. Their students (who required doctorates to get university jobs) made their way into positions at "lesser" universities, spreading the quality of teaching (and music making) out to places that nobody had heard of twenty years before. Chamber music ensembles and chamber orchestras began to flourish, blossom, and record. The recording biz was bopping during the LP era, but, with the advent of superior recording technology, and the portability of the CD, the recording business magically turned music from an activity into a thing. Something you buy. The term "music industry" started to be thrown around, because people made a lot of their living from royalties from these music-holding things. Now these music-holding things produce little to no royalties for musicians (consider Naxos). Before the fidelity of recorded music came near to the quality of the real live thing, people would get their musical fun from being in the very place that the music was being played. They would socialize at concerts, and they would enjoy the communal experience. The experience of listening to music has now become largely a personal one, and most of us do most of our listening privately and through earbuds that are wired to devices that hold huge libraries of music. The amount of music we now have at our fingertips would have blown our minds during the 1970s (and, with all the innovation concerning both old and new music, we thought we had a lot of music at our fingertips then). We are experiencing a change in our way of life. Classical Music can't be given an imperative to change anything, because it isn't a "thing" that can change. There's no "it." Those of us who play, write, write about, study, and listen will continue to do what we do, but we will never regain the kind musical life that we (collectively) once had, unless a magnetic force comes close to the earth and wipes out all of our music-producing devices that require electricity. That would put musicians back in business. 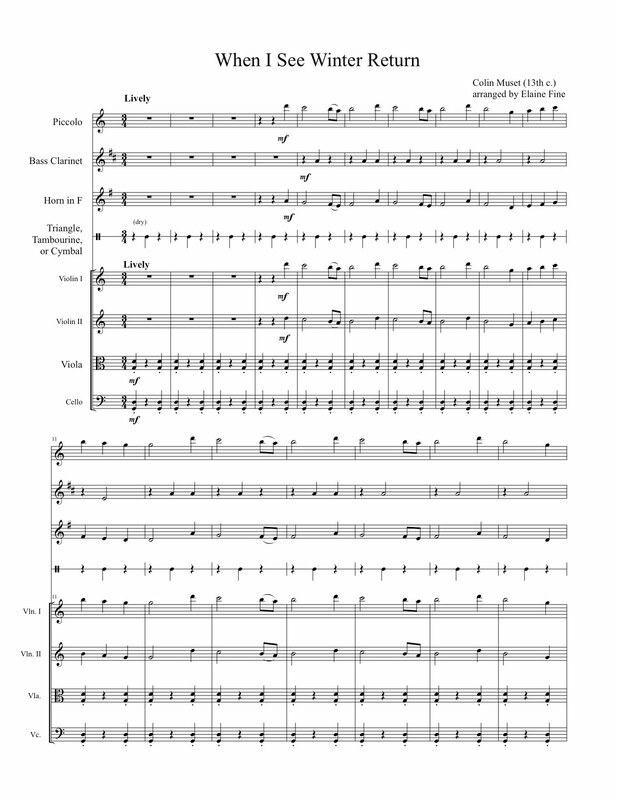 I have finally finished "Four Pieces from Doktor Faustus" for viola d'amore and piano. You can see it and hear it here. Perhaps it is because Liz Mann and I grew up in the same musical environment (we grew up in same town, played the same instrument, and had the same Juilliard education at the same time) that I want to agree with her statement that perhaps the musical world is, like the rest of the world, going through growing pains. It was pretty exciting for me to see and hear her in this New York Times interview, so I thought I'd share it here. Unfortunately, everything else I hear, read, and experience tells me that there is nothing positive about the prospects for a professional orchestral musician in a major city (like New York) to make a living by freelancing. The parent article in the Times makes it very clear that the freelance world is really experiencing the "pain" part of these "growing pains." The current Broadway theater seems to call for more of a rock-based set of instruments than the Broadway theater of 20 years ago. When synthesizers made their way into the Broadway pits around 30 years ago, I knew that it was the beginning of the end for freelance musicians. Now, from my Midwestern perch and through the window of the internet, I feel like I'm watching a whole way of life crumble. There are more competent orchestral musicians around now than there have ever been, and budgets for Broadway shows, even in this economy are breaking records. The cost of producing the first run of Spiderman on Broadway, for example, is $65 million. The music for it, written by Bono and "The Edge," is probably intended to be played by a rock band ("The Edge," from what I can understand, is an electric guitar player). I can't imagine that the music is scored for a very large ensemble, and I can't imagine that any of the musicians would be orchestral freelance musicians (unless they double on instruments appropriate for a rock band). I suppose that the producers of shows like this one feel like they will get more of a return on their investment if they present their work to particularly proven target audiences: people who loved the Spiderman movie, people who are nostalgic about U2, people who like going to rock concerts, and people who like seeing shows that have special effects. We can't forget that comic book characters also appeal to children. If the money rolls in, this trend will certainly continue. Part of the experience of watching dance used to involve the relationship between the musicians and the dancers. Too many dance companies now perform with recorded music, and audiences seem to accept it. Perhaps they believe that the state of the economy dictates that it is just too expensive for dance companies to perform and tour with actual musicians that they have to pay. Perhaps audiences have become numb, or perhaps they have simply become complacent. Perhaps these growing pains are really shrinking pains. Perhaps the notion of being a professional freelance musician in a major city is going the way of the wheelwright or the cooper. Because most recipes for harissa call for an array of reconstituted exotic dried peppers, I always considered it complicated and intimidating. I decided to go the simple grocery store supply route, and used a fresh serrano pepper for a harissa I made to go with Moroccan vegetable stew (sweet potatoes, carrots, zucchini, onions, chickpeas, celery, and an array of North African spices like turmeric, coriander, ginger, clove, and cumin). It was not too overwhelmingly spicy, had a very nice color and consistency, and took about ten minutes to make. Chop up one clove of garlic and sauté it in a little olive oil. Add the peppers and cover the pan. Mix everything up with a blender (immersion or otherwise). While making a comment on a post concerning authenticity over at Gretchen's Pianos, I thought of the attitude certain kinds of performing musicians have towards an audience is that of a kind of "movable me." Very often this kind of performing musician's playing involves a kind of schtick, and often this kind of performer considers the audience something he or she is playing "at" rather than "to." This is not always the case, of course, but it is often the case when a performing musician considers a performance "all about me," rather than "all about the music." I'm coining the phenomenon of a touring musician, who has very little regard for either the audience or the music he or she is playing, as a case of "movable mi." I suppose you could have movable sol for a truly heartfelt performance, where the traveling performer shares very deep personal feelings and insights through his or her music making to every audience (this would be the opposite of "musical mi"). Movable re would be appropriate for a touring musician who brings lights, electronics, and other technical glitz to his or her performance venues. Movable ti could be appropriate for harpists and small ensembles who play at teatime in fancy hotels (movable si would be for entertainers on board ships). We shouldn't forget the other kind of movable do. That's what you get when a performing musician is paid by a third party. I have been busy with other writing projects this Hannukah season (a piece for viola d'amore and piano based on Thomas Mann's novel Doktor Faustus), so "Hannukah Latkes," will have to suffice for this year as well. Perhaps you remember it from last year? If you are new to the blog, make sure to give it a whirl. It is saturated with true Ashkenaz-American spirit (and is all about oil). You can download the music (for free, of course) right here. This installment includes a cautionary tale about tension from Erick Friedman, and is something that every fiddle player should read. Catalog season seems to be in full force in my mailbox (the postal one that hangs outside of my front door). Yesterday's cache had a catalog clearly targeted for men, or, as much of the copy reads "gentlemen." This one has a soup maker that chops vegetables for you, a toaster that cooks your eggs, a $1,400 Swiss Army Knife that has 87 tools, heated socks, and various other articles that might make appropriate gifts for the man who has everything. The copy above is filled with statements that give the impression that the fiddle is more than what we know it is. The "string instrument standards set by the Music Educators National Conference" are standards in size, and not quality. I don't know how a violin could exceed these standards and still meet them. Hmmm. Then there's the "precisely balanced" Brazilwood bow." I imagine that it lives up to factory specifications, and that there might have been some precision involved in measuring the mold for the plastic frog, and I imagine that the length and shape of the stick would be precisely measured. Other than that, the statement says nothing. The phrase "authentic full-size instrument" is also meaningless. I don't know about "mastering" any kind of fundamentals on this kind of instrument. Many people who play rare Italian instruments are still on the road towards "mastering fundamentals." Caution! If you want to give a violin as a gift to anyone, don't buy one from a general-merchandise catalog. Contact a teacher, and arrange for a number of introductory lessons. Call up (or e-mail) a respectable violin shop and rent an instrument (your teacher should have some good recommendations).